Good Morning! A little late with my post as my scheduling has gone to pot! The new challenge for the Pink team at Eclectic Ellapu has started and we would like to see your projects featuring banners, balloons or bows. For my project I used a cute image from Sassy Cheryl that is the ultimate Party Girl! I used some paper from Craft Asylum for my background, the balloons were cut using a free die that came with one of the craft magazines and I used some wired treads for the strings. 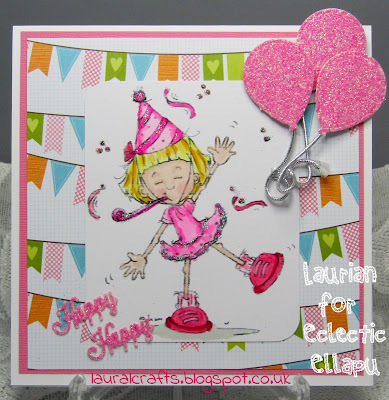 The words were cut from the same pink glitter card as the balloons using an only words die from Crafters Companion (it is actually Happy New Year but I just used the Happy word! ).The touch of sparkle on the image is from a Trimcraft glitter glue, they have glitter and pearls in their new range and they are fab! So come on over and show us your banners, balloons or bows we are all waiting to see them!